Nizmar Resort is located just 500 meters from the renowned Calangute Beach. Come, experience the true essence of Goa and feel at home at our 104 spacious & beautifully decorated A/C suites equipped with Telephones and CTV. Our aim is to provide unlimited leisure with unparalleled delight. A holiday at Nizmar is an experience to savor, to relish and to treasure. So come and enjoy your holiday and transform it into treasured memories. We have excellent restaurants offering multicuisine and speciality food. Time Out: Coffee shop which overlooks the poolside and serves hot snacks, mini meals & beverages. Steakhouse: For a fascinating experience we have multi cuisine A/C restaurant which serves lipsmacking meals. Fusion: If you like barbecues drop in at our pool-side which serves a choice of grilled & tandoori preparations for dinner. Sixth Sense: Our A/C pub, you can quench your thirst and build an appetite. Rooftop Restaurant: Our speciality Chinese and experience authentic Chinese & Thai food. 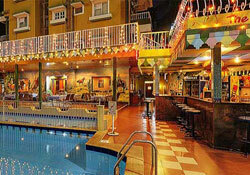 Conference Facilities, Swimming Pool, Steam, Massage, Ayurvedic Massage, Gymnasium, Aroma Therapy, Reflexology (Prior appointment is required), Indoor Games, Pub, Disco & Karaoke, Doctor on call, Currency Exchange, Rent-a-car, Flight Reservation / Reconfirmation, Business service - Fax, Photocopying, Secretarial services available between 9:30 am to 5:30 pm., Laundry service, Beauty parlour.